Don't fret, skiers and snowboarders. 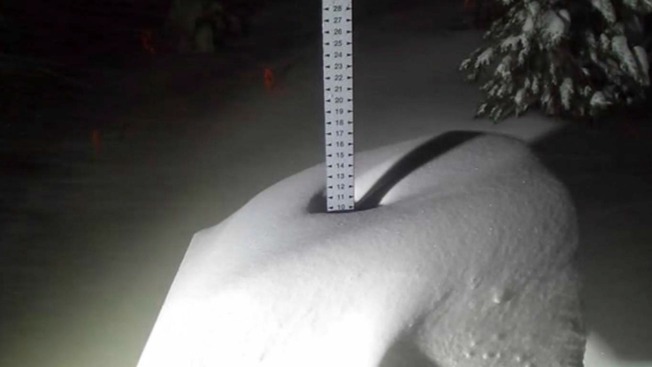 After a weekend of heavy rain and flooding in the Sierra Nevada, the latest round of winter weather on Tuesday is dumping several feet of fluffy, dry powder on the mountain range. A system moving across Northern California on Tuesday and Wednesday is expected to dump two to five feet of fresh snow along the Lake Tahoe shore level. Elevations above 7,000 feet could accumulate four to seven feet. To winter lovers' delight, even more snow could fall during the second half of the week as well. The latest heavy snowfall has prompted a slew of warnings in the area, according to the National Weather Service. Blizzard and avalanche warnings are in effect until Wednesday morning. A winter storm warning and a flood warning are also in effect until Thursday. Aside from the substantial snow, gale force winds throughout Tuesday and Wednesday along ridge lines could reach 135 mph to 145 mph at times. Those dangerous conditions prompted some Lake Tahoe ski resorts, such as Squaw Valley and Alpine Meadows, to close completely on Tuesday. A number of other resorts, including Northstar, are warning skiers and snowboarders to be prepared for delays. Folks not already hunkering down near Lake Tahoe won't have the easiest time traveling to the area. Interstate-80 as of Tuesday morning is closed from Colfax to the California-Nevada stateline. Highway 50 travelers — excluding those with four-wheel drive vehicles — are required to carry chains. The drive from the Central Valley to South Lake Tahoe could take several hours.